The recently released Mac OS X 10.7 “Lion” (read my review of it at The Guardian) includes a new version of Mail, Apple’s desktop email client. There are several new features in Mail that I’m enjoying, and one of the least promoted is the new Favorites Bar. I think it’s very useful, particularly if you like to use keyboard shortcuts as much as possible, and so I’ve written this brief article describing how it works. You can drag mailboxes to reorder them, drag them off the bar to remove them, and drag other mailboxes into the bar to add them (including Smart Mailboxes). Each one will show the unread count for that mailbox in parentheses, if it’s non-zero. They serve as drop targets for dragged messages too (except for Smart Mailboxes, of course, whose contents are controlled by search criteria), which is handy if you’ve hidden the mailboxes list using the widget at the left side of the Favorites Bar for a more iOS-like experience. A keyboard shortcut of Command-n is applied to each of your favorite mailboxes in sequence, with n being a number starting at 1. You can trigger the shortcut to open the corresponding mailbox (i.e. to select it in the mailboxes list, displaying its contents). Here, a keyboard shortcut of Command-Control-n is applied to each of your favorite mailboxes, again with n being a number starting at 1. With messages selected, you can move them to any of your favorite (non-Smart) mailboxes using the corresponding shortcut. 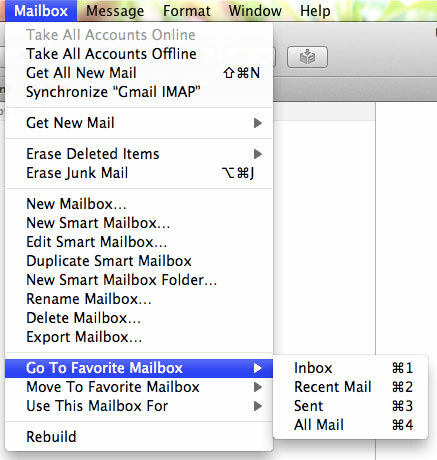 Prior to Lion, Mail was never particularly good at allowing quick keyboard-navigation between specific mailboxes, or the ability to move messages without using the mouse. The new version of Mail goes some way towards fixing these problems, and is substantially more usable because of it. If you enjoyed this article, you may want to follow me (@mattgemmell) on Twitter to hear about new posts as soon as they’re available.